AFP - MADRID (AFP) - Spanish researchers on Friday said they had unearthed a human tooth more than one million years old, which they estimated to be the oldest human fossil remain ever discovered in western Europe. Jose Maria Bermudez de Castro, co-director of research at the Atapuerca site said the molar, discovered on Wednesday in the Atapuerca Sierra in the northern province of Burgos, could be as much as 1.2 million years old. 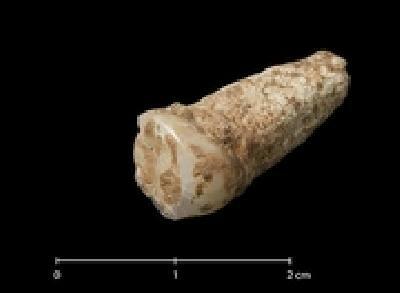 "The tooth represents the oldest human fossil remain of western Europe. Now we finally have the anatomical evidence of the hominids that fabricated tools more than one million years ago," the Atapuerca Foundation said in a statement. "Since it is an isolated fossil remain, it is not possible at this point to confirm which Homo species this tooth belongs to," the foundation added, but said first analyses "allow us to suppose it is an ancestor of Homo antecessor (pioneer)." In 1994 at the nearby Gran Dolina site several Homo antecessor fossils were uncovered, suggesting human occupation of Europe around 800,000 years ago, whereas scientists had previously believed the continent had only been inhabited for around half a million years. Subsequent findings in various sites across Spain lent further credence to the earlier date. The Sierra Atapuerca contains several caves such as the Gran Dolina site, where fossils and stone tools of Europe's earliest known hominids have been found. Researchers found the molar in the Sima del Elefante section of the sierra which had previously yielded fossils from mammals including bison, deer and bear as well as birds and a mouse. The foundation said studies of the geological level suggested it was more than one million years old but that final results were being awaited prior to "publishing this extraordinary finding in a research journal of the highest scientific prestige." Bermudez de Castro, one of three paleontologists leading the expedition, said the fossil appeared to be "well worn" and from an individual aged between 20-25. "For the time being we have no idea what species but there is no doubt, from the (geological) level where the tooth was found, that it belonged to the oldest European found to date," he added. Excavations in recent years in the sierra have uncovered human remains ranging from early humans through the Bronze Age to modern man. Atapuerca's most famous site is "Sima de los Huesos" (pit of bones) and fossils found there date from at least 350,000 years ago.